Why would anyone care about that? My thanks to Clare McNamara, a trusted advisor of mine who reminded me very quickly that not only did people care but that my work did matter and I should embrace my success. We all should. She’s right. So what is it about embracing success that is so hard? After all everyone wants a piece of success and when things go belly up, no one is around to claim the credit to such, right? We simply don’t take the time to celebrate and embrace those moments that belong to us. It’s because that while success is sweet, it can be just as bitter. So we all want to be successful in our own right, and when it’s time to claim that finish line, we must do the end-zone happy dance on the inside, and forget about embracing success outwardly? For if we truly embraced our success that would put us in a whole class of our own kind…you know those confident successful awesome women who aren’t afraid to own their touchdown? Oh how DARE you show us what you are made of! How dare you liberate us from our own fears of failure, boxes, and small thinking? 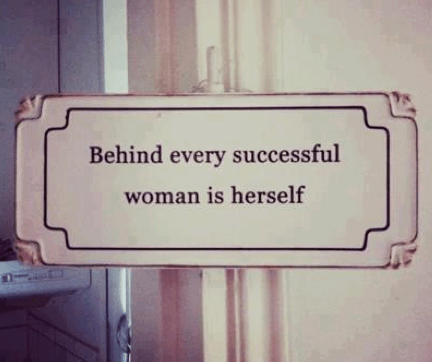 The sad fact is there are a lot of women (and men) who just can’t accept success in others because they don’t see success in themselves….or they have a false sense of self. I know this is frustrating but encourage them to be their best … but don’t let them pull you down. Embrace your success. Clare’s article this week about embracing success is spot on. The questions she poses are good nuggets about how we can shift our thinking around women embracing success. What do you think? What are you (or the women you know) doing to embrace success (it’s okay, tell us those secrets!) Why do the women you know fear embracing their success? I personally think it’s time we all took up end-zone dancing. In the words of Marianne Williamson “We ask ourselves ‘Who am I to be brilliant, gorgeous, talented, fabulous? Actually ‘Who are you not to be”. Celebrating our successes and the achievements of others is not boastful – it is a recognition and celebration of the gifts we are given. Thanks Katie and Clare for helping to open the door and letting in the light. One of the reason I can open the door to the light is because I have been fortunate enough to have people do that for me, a lot! Now I am going to try some end-zone dancing!! Count me in as your dance partner!! Okay friend. Let’s go CHA CHA! Three words: Pay it Forward! That’s why women succeed. Our success should be a part of who we are. And we should not measure our success against anyone elses, if it’s success to us, that is the important thing. Someone will always be paid more, be liked more, have a bigger house, a smarter kid, or a better job. But . . . our success should be in the areas that are important to us. Embrace it, give thanks for it, wear the smile and do the happy dance! It’s yours!! HUGS!